Environmental performance and material health are rapidly becoming specification requirements. But today’s product transparency information is encoded in static reports full of technical data, which limits its use – and its potential to build business. Manufacturers who can explain what that data means and what they’re doing to make meaningful improvements, are informing greener purchase decisions and building a credibly greener brand. Environmental performance is the latest criteria in product design – and now in product marketing. Thanks to industry drivers and growing demand, environmental performance has taken its rightful place alongside functional performance, cost, aesthetics, safety and other criteria in product creation and purchasing. Manufacturers make trade-off decisions between these criteria to determine what products to make, and how to make them. To put an end to greenwashing, the market has demanded more scientific and rigorous methods to support manufacturers’ green claims. Thus, environmental performance has become part of product marketing. There are volumes of international standards that lay out the rules for measuring, reporting and publishing environmental information about products. These reports are referred to as declarations or disclosures. They are detailed, often lengthy technical documents that may include some information about the product’s functional performance and attributes, but environmental disclosures are intentionally created separate and apart from the other information manufacturers create to market and sell their products. Synonyms for disclosure include words such as: confession, exposure, leak, betrayal and declaration. The word disclosure suggests the unveiling of information the owner would prefer to keep hidden. Many manufacturers feel this way, which is why uptake is not rapid. Legal issues about disclosing hazards and concerns about numeric results that aren’t actually comparable are keeping many manufacturers from being transparent while asking "what’s the value?" While increasing in popularity and market demand here in North America, product environmental performance reporting remains voluntary and optional. If the only way today’s standards programs allow for providing information is in the form of a technical disclosure or declaration, the value proposition will continue to be difficult to make. It’s a stick, not a carrot. Real marketing is about what’s true and communicating that information to the market. Unfortunately, in the sustainability world, the word marketing has carried a stigma. If it’s marketing, there must be spin and can’t be entirely true. But manufacturers investing in life cycle assessment (LCA) and material ingredient analyses and making truly greener products have great stories to tell. Stories that demonstrate, using science-based methods, these manufacturers understand their products’ impacts and have knowledge as to where to invest in improvement and innovation. They should have the opportunity to provide comprehensive environmental performance and material health information to the market in a way that makes it useful, understandable and meaningful – thereby making it easier for stakeholders to make informed greener decisions. Delivering it together with all the other product information would make it easier to manage and more useful for all involved. Soon, just box-checking won’t satisfy real transparency demand. They are scientific documents. Great for an audience knowledgeable about LCA and material science, they are not of much use for manufacturers’ sales and marketing teams, or for a builder’s efforts to gain community support or to attract tenants. Yet the process itself, the results of the analysis, and the move toward improvement all make powerful marketing stories. They may as well be carved in stone. Environmental reports are presented as static PDF documents, limiting their online searchability, findability and data reuse. Their presence is not necessarily an indication of a greener product. LCA results do not identify what to do to improve; they only help manufacturers understand where the impacts and environmental burdens are. It’s the same with material ingredient analyses. They identify hazardous ingredients, but don’t explain the exposure concerns and risks, or why the manufacturer chooses to use certain ingredients or what’s being done to make improvements. In fact, there is much to promote. 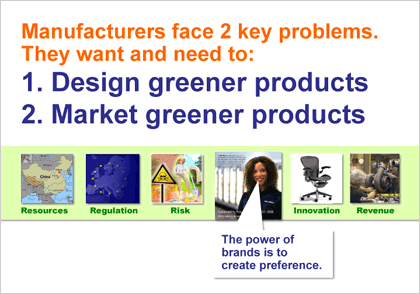 Manufacturers making greener products are doing so by making informed trade-off decisions. They have understandable and meaningful information to share about how they make their products and what they’re doing across the lifecycle tomitigate impacts and achieve meaningful improvements. This is the information that makes sense to people. Product transparency builds credibly greener brands. The value for manufacturers to provide environmental information about products is to build a credibly greener brand – by demonstrating they understand their products’ material health and environmental performance. Making greener purchase decisions requires understandable and meaningful information. Truth builds trust, trust builds powerful brands and powerful brands create preference and value for their companies. We named our company Sustainable Minds because people making products must start thinking the same way before they can act the same way – from a life cycle perspective. We were the first company to offer a cloud software solution for product teams to use in early stage design to start integrating environmental performance into the way they make products. SM Eco-concept Modeling & LCA software is easy to understand and use. The same motivation inspired the SM Transparency Report™ Program. It’s time to start thinking the same way about product transparency from 'disclosure' to real marketing value.